A distributed architecture comes into play when Daikin split and multi-split air conditioning systems are installed. Indeed, they stand out from location-dependent air conditioners, which is no surprise, but they also dominate other branded split designs. Considered a yardstick by other distributed solutions, it’s about time we understood why this stylish product range tops the air conditioning medal table. Initially, the outdoor unit takes charge by pulling in large volumes of fresh air and distributing that air as a comfortably conditioned breeze to every room, but there’s also a localized ingredient at work. Room controllers are working individually to independently control the temperature. That’s a feature that stands out from the pack. It enables the homeowner to save energy and really focus on providing comfort just where it’s required. Arguably, a few competitors do nip at the heels of Daikin by adopting a similarly independent control system, but their inner components are dumb and blind. Smart technology is the only way forward here. 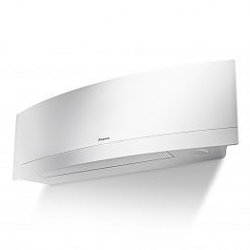 Intelligent electronics and innovative inverter stages add to the power of the air distribution model, thus taking the climate-apportioning architecture to an entirely new level. This plateau hosts a range of cutting-edge inverters, energy-efficient heating pumps, and smart thermostats. The terminating nodes of the split and multi-split airways augment this approach by incorporating humidifiers, stages that condition the air. Followers adopt current trends, but the innovator creates those selfsame methodologies. And so it is with a state-of-the-art installation procedure. A single outdoor unit is married to a base indoor air conditioning node, with the multi-split alternative augmenting this layout by incorporating up to four additional air conditioners, but there’s no need for ductwork, so the installation stays within a cost-effective envelope. If anything, financial considerations are freed from the construction side of things so that they can be applied to the advanced air conditioning solution. Finally, that same adaptable installation model extends to encompass a variety of differently equipped indoor units, so comfort levels in different zones will scale according to the room’s requirements. Air distribution networks are notoriously inefficient because of their unselfish tendencies. The air is lost in ducts and in leaky equipment. Daikin split and multi-split air conditioning equipment rejects this wasteful operating model by adopting the finest, most energy-efficient indoor and outdoor parts, components that don’t require leaky ducts. They’re scalable, extendible, and built to perform better than their energy-hungry peers.